Abbigail Waddell and Nathaniel Boisjolie-Gair test a pressure system they and other students developed for the subscale Prandtl-D 3C glider. 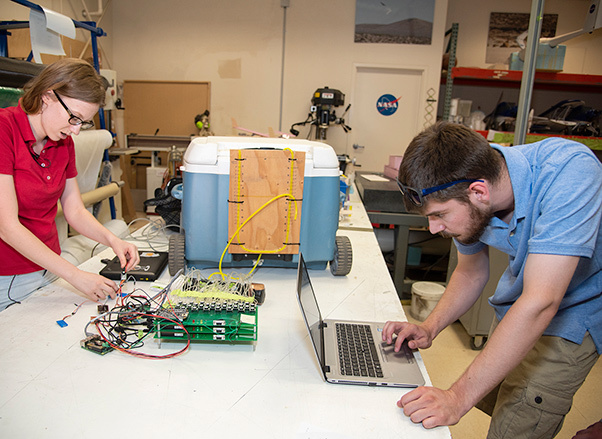 Abbigail Waddell leaned over bundles of wires and circuit boards to see if a system she had helped develop with other interns for two summers at NASA’s Armstrong Flight Research Center in California was ready for testing. Waddell, who attends North Carolina Agricultural and Technical State University, where she is studying electrical engineering, adjusted the electronic pressure measurement system, or EPM, and nodded to signal it was ready. Chris Jensen, who is a mechanical engineering major at Embry-Riddle University in Prescott, Ariz., blew air through a large rubber tube and a gauge indicated the pressure was rising, as Jensen continued to blow. Nathaniel Boisjolie-Gair, who is studying mechanical engineering at North Dakota State University, monitored a computer screen to see if the system was measuring the pressure of Jensen’s breath. Stephen Harris, who is studying electrical engineering at John Brown University in Siloam Springs, Ark., made sure data were recording. The test was a success. Deborah Jackson integrates a pressure system she and other students developed for the subscale Prandtl-D 3C glider. Along with nine other interns, the students assisted Armstrong Chief Scientist Al Bowers with developing, testing and integrating the system into the subscale Preliminary Research Aerodynamic Design to Lower Drag, or Prandtl-D 3C glider. A flight series Aug. 1 demonstrated their system could measure pressure from the surface of the aircraft’s wing, providing additional evidence that a wing design method using twist can dramatically increase aircraft efficiency. Before the aircraft was ready for flight, however, there was more work to do. With the system validated, students crafted a box for it with a 3D printer. Then the system was installed in the aircraft. 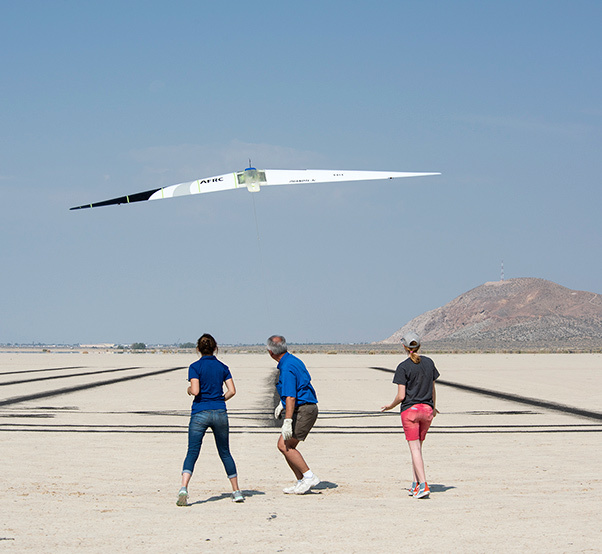 Deborah Jackson, an aerospace engineering student at Embry Riddle, Prescott, Arizona, was one of the students who meticulously helped connect each of the 89 tubes from the system along the glider’s wingspan. The small plastic tubes were also attached to transducers, which convert the air pressure on the wing to electronic data, and then to pressure points all along the glider’s wing. During the previous two summers, Jackson worked on the Fiber Optic Sensing System flown on the aircraft, which gathered data last summer on strain on the aircraft’s wing. This summer, she is helping seek similar data through pressure on the wing. So far, it looks like the two methods are yielding the same answer. With all of the connections made and additional ground testing and the necessary preflight reviews complete, the students were ready for flight. 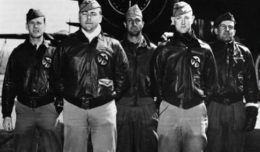 The weight of the new system made the aircraft heavier toward the nose, and without a breeze the July 26 flight was limited, but data was acquired on the first try. The team tried again Aug. 1 and this time a light breeze helped the flight tests. After a few successful attempts, students carefully made measurements and computations and shifted the weight for the aircraft to fly even better. With the data in hand, the students were able to use computer programs they had scripted to see what story the data revealed. 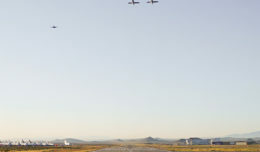 The subscale Prandtl-D 3C glider, carrying a pressure system developed and integrated by students, successfully flies at Edwards Air Force Base in California. Bowers said other data systems students developed will give additional information about what is happening to the aircraft in flight. “We are looking at the aircraft’s acceleration, the gyroscopes that tells you how quickly the aircraft is turning around its three axes, as well as the airspeed and altitude. That gives you the full picture of what’s going on,” he said. Combined with the models, the FOSS data and now the pressure data, there is a compelling argument for wing twist. “The comparison of this data and FOSS data are not complete yet, but the hairs on my arm are rising because I know we are going to go back to the 1933 paper and show that we have validated what Prandtl did,” he said. That’s where the students will continue to have impact long after their internships are completed. 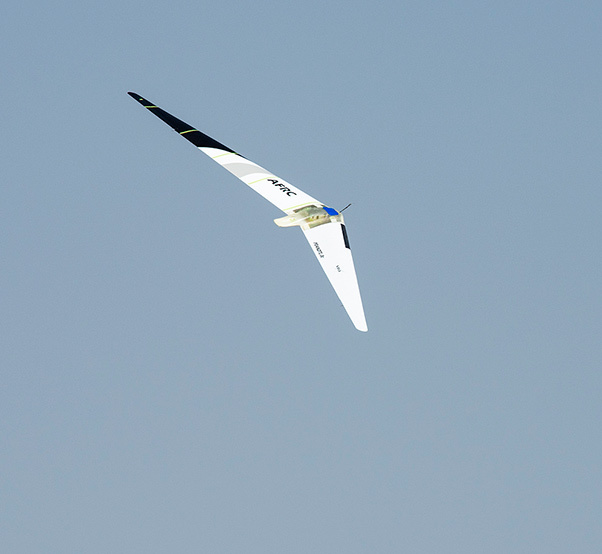 Deborah Jackson, Al Bowers and Abbigail Waddell successfully launch the subscale Prandtl-D 3C glider. The wing efficiency from the method would be 12.5 percent, with the elimination of a tail increasing efficiency by another 30 percent. For propellers, efficiency would boost by 15.4 percent, Bowers said. David Berger, Armstrong’s University Affairs officer, said the opportunities are what the Armstrong Office of Education is all about and 10 students participated in this summer’s Prandtl-D 3C effort.